Research that provides women with PCOS, and other androgen-related diseases, the highest level of care and quality of life. 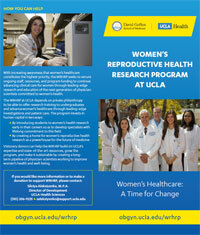 Welcome to the Women's Reproductive Health Research Program and thank you for your interest. Our program was developed in 2013 to support basic science and clinical research regarding reproductive and metabolic problems related to polycystic ovary syndrome (PCOS) and other androgen-related diseases, including infertility, miscarriage, hirsutism, obesity, diabetes and cardiovascular disease. At a time when research support for this area of women’s healthcare is so limited, our program was created to integrate highly-experienced scientists with a multidisciplinary approach to cutting-edge research that improves the understanding and healthcare of women with these disorders. The goal of our program is to support research that provides women with PCOS, and other androgen-related diseases, the highest level of care and quality of life. To do so, the Women’s Reproductive Health Research Program is committed to providing opportunities for students and young investigators to work within this exciting scientific and medical environment and develop their careers in reproductive medicine. We've been highly successful in this regard, with multiple research projects of the program being presented at international meetings and published in peer-reviewed journals by its integrated teams of senior scientists, clinicians and students. I am also delighted to say that the program has received funding through the National Institutes of Health (NIH) and continues to increase its efforts in attaining extramural financial support. Thank you once again for your interest in our Women’s Reproductive Health Research Program. Please take a moment to review our website and see for yourself the accomplishments of our students in 2013. 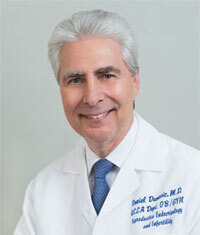 It is my hope that you will make a financial contribution to our program, which will be used to advance our understanding of PCOS, and other androgen-related diseases; promote the highest level of care and quality of life for these women; and train the future scientific leaders in this exciting field of medicine. Published on Nov 27, 2015 - A Benefit for the Women’s Reproductive Health Research Program at UCLA under the direction of Dr. Daniel Dumesic. Co-Sponsored by Santa Monica Bay Woman’s Club and Santa Monica Sports Club.